Duluth, 25 miles northeast of Atlanta in Gwinett County, is an old city that has been an important crossroads to the area since the Cherokee Indians first settled here. In 1821, Evan Howell, developed the town of Howell Crossing near the Chattahoochee River. The town later evolved into a major artery for the railroad and was named Duluth, after another town in Minnesota. Duluth is a popular and rapidly developing suburb of Atlanta, falling close to Interstate 85, which allows a quick commute to Atlanta. Duluth remains a busy hub today, continuing in the area's great business and residential expansion. Despite phenomenal growth, it has remained its small-town character, where personal camaraderie, spirited by annual holiday and festive events, is savored. Duluth is home to more than 22,000 residents who live, work and play in its 9.8 square-mile community. Duluth’s motto, "Pride in the Old and New" shows its commitment to maintaining the city’s historic integrity while being progressive and forward-looking. 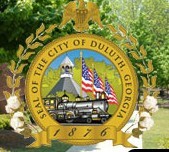 Duluth real estate is now one of the fastest growing and prestigious markets in Georgia. Because of Duluth’s progressive nature, strong sense of history, and fame as one of the most financially stable cities in Georgia, many buyers are interested in settling down here. Whether you wish to buy single-family homes, townhouses, or any other residential units available in Duluth, you can count on Executive Home Sales and the Terry Hayes team to help you out. Contact us today to begin the process of acquiring your dream home in Duluth or anywhere else in the North Atlanta market.